Taken from the film #BeRobin The Movie, by Kurt Weitzmann. Screening on Friday, April 29th at the CSM Asian Pacific American Film Festival. The College of San Mateo Ethnic Studies Department presents the 7th Annual Asian Pacific American Film Festival! #BeRobin The Movie by Kurt Weitzmann. 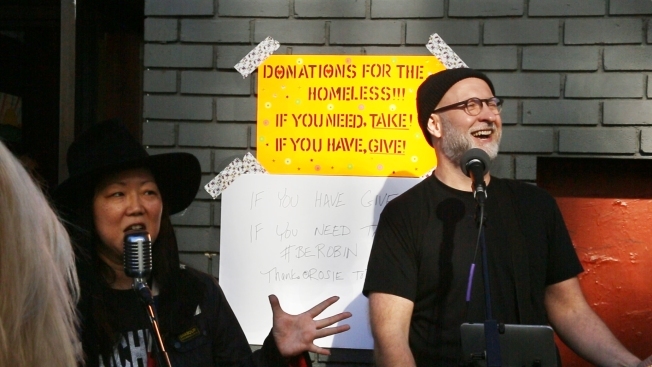 After the death of her friend Robin Williams, comedian Margaret Cho took to the streets with the mantra "Don't grieve Robin, Be Robin." She started on a corner with a bag of socks and a guitar case which turned into an amazing humanitarian street theater experience. Q&A with filmmaker Kurt Weitzmann and panel. The Friday Evening program is a partnership with the Psychology/Philosophy Film Night. South American Cho-Low by Phuong-Cac Nguyen. This short documentary is about East Los Angeles lowriders culture and how cholo style finds its way to Brazil. Korla by John Turner and Eric Christensen. Korla is a documentary about a TV pioneer, a spiritual seeker, and the godfather of exotica music, organist Korla Pandit. Korla Pandit, successfully passed as an Indian from New Delhi, when in fact he was the son of an African American minister from Columbia, Missouri. Q&A with filmmakers John Turner and Eric Christensen. Live performance by The Autonomous Region. Chinatown Two-Step by Eddie Wong. An Asian American film classic which looks at a Chinese American marching band from LA's Chinatown. Right of Passage by Janice D. Tanaka. Right of Passage tells the history of the Japanese American Redress and Reparations movement. Q&A with filmmakers Eddie Wong and Janice D. Tanaka. Live performance by Charlie Chin. Admission for Friday's program is free. Saturday's programs are a $10 donation. Admission for students with ID and SMCCCD employees are free. Tickets are only available at the door. Parking is free in Beethoven Lot 3.